The exchange of information is essential for both the organization of nature and the social life of mankind. Until recently, communication between people was more or less limited by geographic proximity. Today, thanks to ongoing innovations in telecommunications, we live in an Information Age where distance has ceased to be an obstacle to the sharing of ideas. 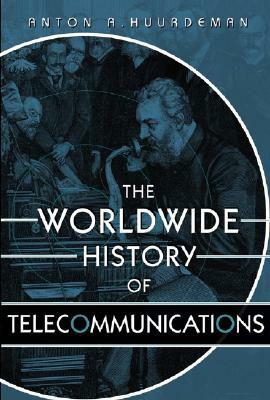 The Worldwide History of Telecommunications is the first comprehensive history ever written on the subject, covering every aspect of telecommunications from a global perspective. In clear, easy-to-understand language, the author presents telecommunications as a uniquely human achievement, dependent on the contributions of many ingenious inventors, discoverers, physicists, and engineers over a period spanning more than two centuries. Broad in scope, yet clear and logical in its presentation, this groundbreaking book will serve as an invaluable resource for anyone involved or merely curious about the ever evolving field of telecommunications. AAP-PSP 2003 Award Winner for excellence in the discipline of the "History of Science"
ANTON A. HUURDEMAN studied electrical engineering in Amsterdam and international business at Nyenrode University. He made a career in the exportation of telecommunications systems, working successively for Telefunken, ITT, and Alcatel. In 1992, he retired from his position as Transmission Product Manager at Alcatel headquarters in Paris to become an independent telecommunications author living in the Black Forest. He is married and has two children.